Products based on important people in African American history. We owe a great deal to them! Andrew Jackson Young (born March 12, 1932) is an American politician, diplomat and pastor from Georgia who has served as Mayor of Atlanta, a Congressman from the 5th district, and United States Ambassador to the United Nations. He served as President of the National Council of Churches USA, and was a supporter and friend of the Rev. Dr. Martin Luther King, Jr.
Booker Taliaferro Washington (April 5, 1856 – November 14, 1915) was an American educator, orator, author and the dominant leader of the African-American community nationwide from the 1890s to his death. Born to slavery and freed by the Civil War in 1865, as a young man, became head of the new Tuskegee Institute, then a teachers' college for blacks. 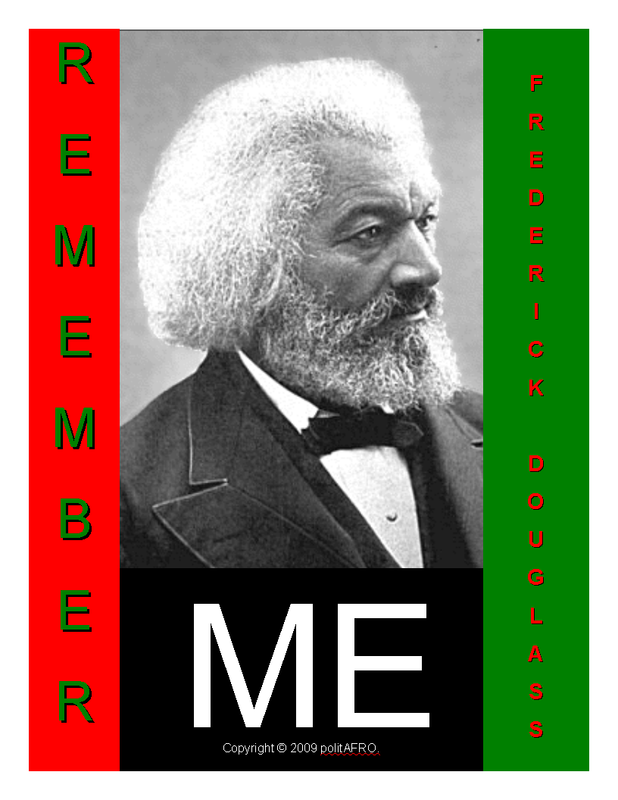 Frederick Douglass born Frederick Augustus Washington Bailey, (born circa 1818 – February 20, 1895) was an American abolitionist, women's suffragist, editor, orator, author, statesman and reformer. 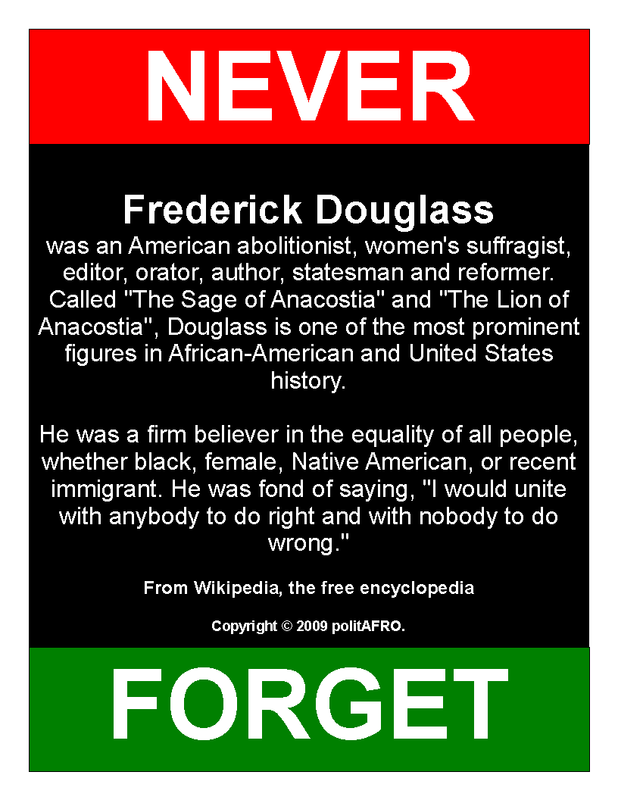 Called "The Sage of Anacostia" and "The Lion of Anacostia", Douglass is one of the most prominent figures in African-American and United States history. Harriet Tubman (born Araminta Ross; c. 1822 – March 10, 1913) was an African-American abolitionist, humanitarian, and Union spy during the American Civil War. After escaping from slavery, into which she was born, she made thirteen missions to rescue over seventy slaves using the network of antislavery activists and safe houses known as the Underground Railroad. She later helped John Brown recruit men for his raid on Harpers Ferry, and in the post-war era struggled for women's suffrage. Ida Bell Wells-Barnett (July 16, 1862–March 25, 1931) was an African American journalist and newspaper editor. An early leader in the civil rights movement, she documented the extent of lynching in the United States. She was also active in the women's rights movement and the women's suffrage movement. James W.C. Pennington (1809 - 1870) was an African American orator, minister, and abolitionist. Pennington was born a slave in Washington County, Maryland. After escaping to Littlestown, Pennsylvania, Pennington moved to New York in 1828. A blacksmith by trade, he settled in New Haven, Connecticut, and audited classes at Yale Divinity School from 1834 to 1839 - becoming the first black man to attend classes at Yale. He was subsequently ordained and became a teacher, abolitionist, and author.He wrote The Origin and History of the Colored People in 1841, which has been called the first history of African Americans, and a slave narrative in 1850, The Fugitive Blacksmith.In 1849 the University of Heidelberg awarded him an honorary doctorate of divinity. Jesse Louis Jackson, Sr. (born October 8, 1941) is an American civil rights activist and Baptist minister. He was a candidate for the Democratic presidential nomination in 1984 and 1988 and served as "shadow senator" for the District of Columbia from 1991 to 1997. He was the founder of both entities that merged to form Rainbow/PUSH. Representative Jesse Jackson, Jr. is his eldest son. According to an AP-AOL "Black Voices" poll in February 2006, Jackson was voted "the most important black leader" with 15% of the vote. John Brown (May 9, 1800 – December 2, 1859) was an American abolitionist who advocated and practiced armed insurrection as a means to end all slavery. He led the Pottawatomie Massacre in 1856 in Bleeding Kansas and made his name in the unsuccessful raid at Harpers Ferry in 1859. President Abraham Lincoln said he was a "misguided fanatic" and Brown has been called "the most controversial of all 19th-century Americans." His attempt in 1859 to start a liberation movement among enslaved African Americans in Harpers Ferry, Virginia electrified the nation. He was tried for treason against the state of Virginia, the murder of five proslavery Southerners, and inciting a slave insurrection and was subsequently hanged. Southerners alleged that his rebellion was the tip of the abolitionist iceberg and represented the wishes of the Republican Party. Historians agree that the Harpers Ferry raid in 1859 escalated tensions that a year later led to secession and the American Civil War. John Robert Lewis (born February 21, 1940) is an American politician and was a leader in the American Civil Rights Movement. He was chairman of the Student Nonviolent Coordinating Committee (SNCC) and played a key role in the struggle to end segregation. Lewis, a member of the Democratic Party, has represented Georgia's 5th Congressional District (map) in the United States House of Representatives since 1987. The district encompasses almost all of Atlanta. Malcolm X (born Malcolm Little; May 19, 1925 – February 21, 1965), also known as El-Hajj Malik was an African-American Muslim minister, public speaker, and human rights activist. To his admirers, he was a courageous advocate for the rights of African Americans, a man who indicted white America in the harshest terms for its crimes against black Americans. His detractors accused him of preaching racism and violence. He has been described as one of the greatest and most influential African Americans in history. Mary Church Terrell (September 23, 1863 – July 24, 1954), daughter of two former slaves, was one of the first African-American women to earn a college degree. She became an activist who led several important associations and helped to work for civil rights and suffrage. Ralph David Abernathy (March 11, 1926 – April 17, 1990) was an American civil rights activist and leader and a close associate of Martin Luther King, Jr. in the Southern Christian Leadership Conference. Following King's assassination, Abernathy took up the leadership of the SCLC Poor People's Campaign and led the march on Washington, D.C. that had been planned for May 1968. Rosa Louise McCauley Parks (February 4, 1913 – October 24, 2005) was an African American civil rights activist whom the U.S. Congress later called the "Mother of the Modern-Day Civil Rights Movement." On December 1, 1955 in Montgomery, Alabama, Parks, age 42, refused to obey bus driver James Blake's order that she give up her seat to make room for a white passenger. Her action was not the first of its kind: Irene Morgan, in 1946, and Sarah Louise Keys, in 1955, had won rulings before the U.S. Supreme Court and the Interstate Commerce Commission respectively in the area of interstate bus travel. Nine months before Parks refused to give up her seat, 15-year-old Claudette Colvin refused to move from her seat on the same bus system. But unlike these previous individual actions of civil disobedience, Parks's action sparked the Montgomery Bus Boycott. Parks's act of defiance became an important symbol of the modern Civil Rights Movement and Parks became an international icon of resistance to racial segregation. She organized and collaborated with civil rights leaders, including boycott leader Martin Luther King, Jr., helping to launch him to national prominence in the civil rights movement. Sojourner Truth (1797 – November 26, 1883) was the self-given name, from 1843, of Isabella Baumfree, an African-American abolitionist and women's rights activist. Truth was born into slavery in Swartekill, New York. Her best-known speech, Ain't I a Woman?, was delivered in 1851 at the Ohio Women's Rights Convention in Akron, Ohio. Thurgood Marshall (July 2, 1908 – January 24, 1993) was an American jurist and the first African American to serve on the Supreme Court of the United States. Before becoming a judge, he was a lawyer who was best remembered for his high success rate in arguing before the Supreme Court and for the victory in Brown v. Board of Education. He was nominated to the court by President Lyndon Johnson in 1967.